The AU Eagles are in the Big Dance for the first time since 2009, and the fellas couldn't be more excited. 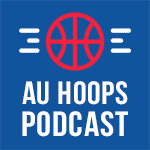 Crespo, Healy and Lloyd are back at the roundtable to break down AU's incredible road to the Big Dance; dissect the Eagles' matchup with Wisconsin; pay homage to one of the AU greats; and much, much more. The fellas gather on a Sunday afternoon to dissect AU's thrilling, come-from-behind semifinal victory over Holy Cross and preview the big championship game vs. Boston University. Get yourself ready for the 'ship with this podcast. The fellas at the roundtable discuss AU's drop to second place in the Patriot League; the ascension of Charlie Jones into the Eagles' rotation; the concession offerings at Bender Arena; and, of course, the huge upcoming game against BU. Tune in!